Blog-hopping (in between sneezing and coughing fits) and can share that there are fab blogs to see along with wonderful candy offers with Debby, Steph and also Claudia who is offering a set of the new Alota stamps which are brilliantly designed to fit with Nestabilities! Love the ovals myself. See my side bar for other candy shouts I may have missed and for dates. My cold is worse today: Feel dreadful and HAD to get my Sister-in-law's 50th card made: Would like to have made something really special but just not up to it at the moment so I have relied on this handmade petal paper and Heidi Swapp bling to carry the show with some ribbon and a flower I put together from a Making Memories Blossoms & Buttons box. The bottom flower is traced from the MM felt one on to the same paper as on the card and inked with Colorbox Rose Petal chalk ink. All held together with a Doodlebugs brad. Sentiment is Doodlebug rub-ons with 50 cut on Cuttlebug from same paper as on card and inked like the flower and covered with holographic glitter glue to give it the same shiny glittery look as the brad. 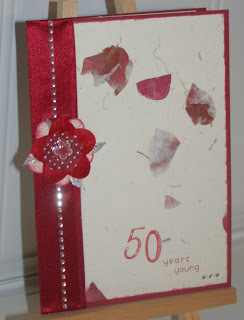 It's A5 and lined with the same rose petal paper. 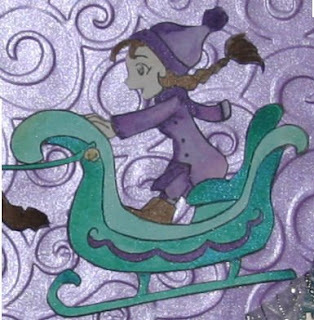 Absolutely thrilled to say Katharina chose my bag topper along with Lacey's to receive the Whiff of Joy stamp Willow with hot chocolate plus some charms. 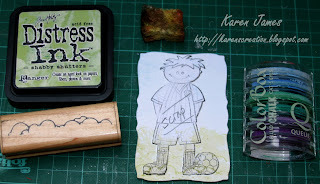 I am really looking forward to getting my first Willow stamp as I only have Charlotte at the moment. If you don't know Whiff of Joy yet have a look in the shop: I love browsing the gallery too. I haven't made many cards this week as I've got a cold and been feeling pathetic but I was using a few scraps from the Making Cards magazine papers when the Paperminutes sketch came in to my head and I decorated across the corners of the raised centre piece following that. I've managed to cover 3 challenges with one card again! Seeing 2 ribbons together made me determined to use them for the 'purple and green' Whiff of Joy challenge and I really wanted to get my new stamp inked so this is first use of that! 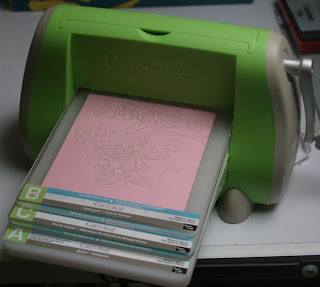 I have also included my favourite Cuttlebug embossing folder, which was the point of the Cuttlebug challenge blog this week and I followed the Friday Sketchers layout turned on its side. Voici ma carte pour le challenge Whiff of Joy. Le thème est les couleurs mauve et vert. J'ai utilisé le WoJ tampon Charlotte avec son traîneau. Cette semaine chez Friday Sketchers, il fallait réaliser une carte selon le sketch de Mumur. Egalement le blog de Cuttlebug Challenge demande nous utilisons nos classeur de gaufrage favorite: J'ai utilisé 'Divine Swirls'. 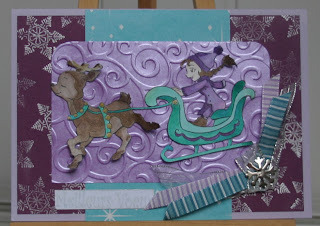 Used: Pollen blackcurrant paper stamped with Brilliance platinum, Papermania patterned paper, Cuttlebug 'Divine Swirls' embossed on pearlescent purple paper, Whiff of Joy Charlotte with Sleigh painted with H2Os, Anita's patterned ribbon, La Compagnie des elfes sentiment with Brilliance silver, Papermania brad and, finally, silver ribbon saved from a Christmas cracker!!! An explanation of one of my paper-pieced and masked images hoping it will spark some ideas for your own use of the technique: Why use Paper-piecing? It's a great way to quickly and easily get the colours you want, adding as little or much 3D as you like at the same time. 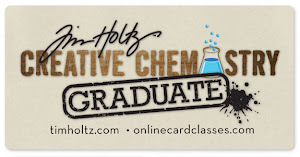 Masking is a great way to give 3D look on a flat surface and/or add background to stamped images. I started with my card stamped and shaped (in this case with Curved Rectangle Nestabilities in the Cuttlebug) and I coloured the flesh parts with watercolour pencils. 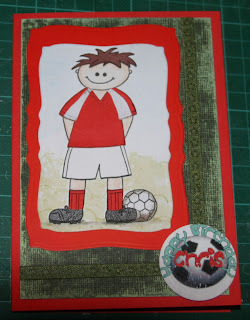 Masking: To give some background colour to my image I stamped on to scrap paper and cut that image out. I placed the cut-out scrap over my main image then stamped and sponged Shabby Shutters Distress Ink to create some grass and used ice blue Colourbox Fluid Chalk direct to paper for the sky. When the scrap 'mask' is removed the original image is clean and looks like it is in the foreground to the colour placed over it. 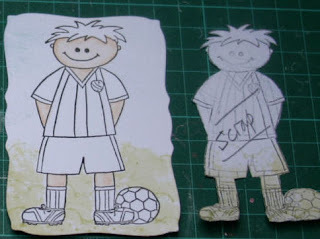 Paper-piecing: For this technique you stamp as many times as you want on to the paper(s) you want on your image: A great way to get parts to match background paper, get the colours you want quicker than many other colouring techniques, and giving texture to the image at the same time. 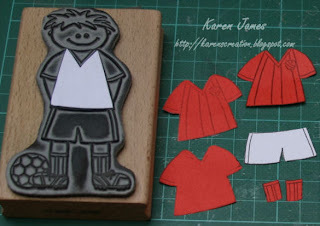 I wanted a particular football strip so I stamped the parts required in the colours needed and also covered part of the stamp to get rid of the stripes on the shirt. I wanted the shirt to stand out so gave that 3 layers. The shorts are in thicker card so were left with one layer. 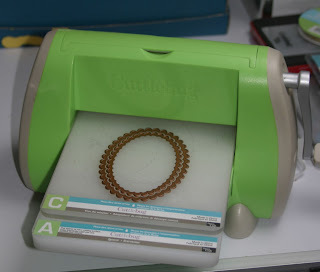 It's important to cut neatly just outside the stamped line on the layer that will show: Hidden layers added for depth should be slightly smaller, cut on or just inside the line, so they won't show. I then added hair and football boots and white detail to the shirt in the same way and coloured the ball and ground a little more for realism. Paper piecing Birthday Sketch ! 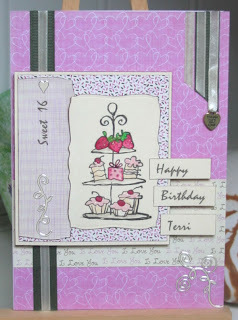 I don't usually combine challenges but this card is a combination of the sketch from Just Christmas and Birthday Cards, the technique of paper piecing on A Spoon Full of Sugar and the 'birthday something' on Stamp Something. Having had the issue of what paper piecing means when I was on the design team of Funky Fairy Papercrafts, I took photos of the process today and then smiled as I have just seen that Nikki has edited their challenge blog to explain what it means too. 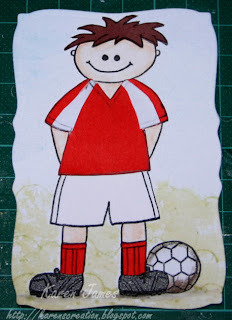 My reason for paper piecing today is wanting a particular football strip so it was plain rather than patterned paper that I needed: The Chris in question is a Bristol City fan! Process to make this is here. Used: Paper: Various scraps mounted on card cut with Mega Nestabilities Curved Rectangles, backed by Core'dinations Hocus Pocus which I sanded; Stamps: 'Creative Stamping' Footballer with Brilliance black ink and coloured with watercolour pencil on flesh parts and masked to create background with DOTS 'sand or snow' stamp and Shabby Shutters distress ink, also sponged on, and Colorbox Fluid Chalk in Ice Blue applied direct to paper for sky. I computer-generated and printed the sentiment and used Anita's Sticky Ribbon. Deux nestabilities ensemble crée une cadre, ou un matrice seulement crée un forme pleine. J’espère que je vous ai aidé ? Bien sûr vous pouvez partager le lien pour ce tutorial si vous pensez il aide quelques autres. Merci. Is Charlotte Angel just for Christmas? I hope I might use her more often. I made this bag topper for a little challenge Katharina has ending today and I'm about to use the recipe for Amaretti she has posted with it! I'll be back later with a card made for the WoJ challenge using the same green and purple combo. I used Pollen 'Blackcurrant' with Papermania printed paper, X-cut punch, Anita's ribbon and Whiff of Joy 'Charlotte Angel' painted with H2Os and gel pen details. Mon sac étiquette pour un mini-challenge de Katharina. 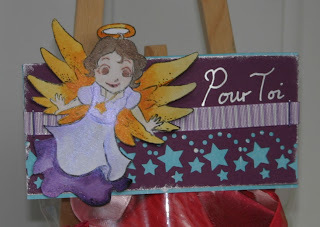 J'ai utilisé le tampon 'Charlotte Angel' de Whiff of Joy avec peinture de H2Os (aquarelles brillantes), Papier de Pollen et Papermania, Ruban de Anita's, perforatrice de X-Cut. Here's my card for this week's Ismaki sketch. It started off with a completely different Tilda and few layers then organically took over and became a completely different card! 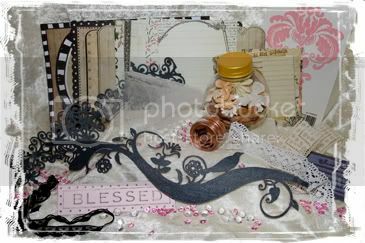 I created the A5 card blank with the Eazi-score board and layered papers including PaperMania patterned vellum, a bit of recycling from an old birthday card for the panel and sentiment, ribbons from stash and the magnolia coloured with watercolour pencils. 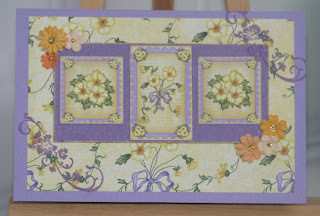 For the Ismaki option of diamonds I cut Floral Borders on the Cuttlebug and used the Xyron to stick them. I'm still not happy with the photo as the pinks look wierd: They do go well together: Honest! Voici ma carte d’anniversaire pour le challenge «Ismaki » qui réaliser le sketch de Isa cette semaine avec l’option de ‘losanges’. J'ai crée la carte A5 avec ma planche Eazi-score. J’ai utilisé un peu de recyclage plus le tampon Magnolia avec crayons aquarelles. 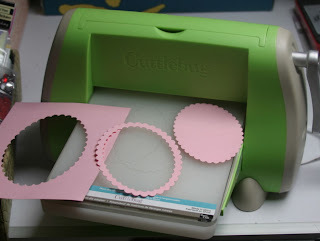 J’ai découpé les Cuttlebug Bords Floraux et j’ai colle avec le Xyron. J’ai utilisé papiers divers inclus calque décoré de PaperMania. Have you seen the gorgeousness that Ewonne has for candy? You don't need an excuse to see her great blog but it's the icing on the cake! And I want my photos to look like that! I'll be posting my Ismaki challenge card in a mo when I can get the camera to talk to the card reader AND like the lighting! 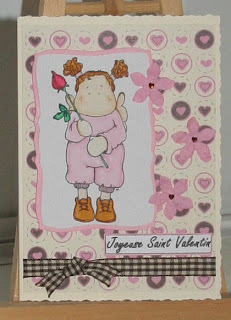 I followed the sketch from challenge 34 of Friday Sketchers for this card and was really pleased with it but I could scream at how bad the photos have come out and the card has already gone in the post. This photo is the best I could get of how the card looks yet the colours are still all wrong. The card is so tactile too: The soft cotton baby grow and fluffy duck, etc. It is for my step-daughter and her husband who had our first grandchild yesterday. It wasn't the birth one would hope for with an emergency cesarean and the baby whisked off to a special unit after swallowing fluid but all are doing well. I personalised the inside of the card by printing the insert with my own paper design and including the baby's names, date of birth and weight. First valentine of the year ! This one is following Nikki's sketch for challenge 33 on A Spoon Full of Sugar. 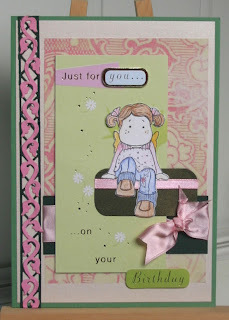 Used: Magnolia coloured with Whispers markers and cut with nestabilities; Papermania paper, flowers and gems. 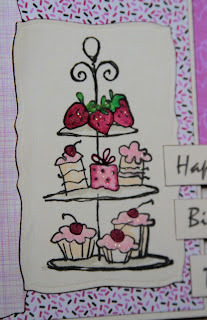 I used the Ismaki sketch to make a card for my neice's 16th birthday and used my new Papermania Scrumptious papers and the new-to-me Stampendous Tier of Treats stamp coloured with Whispers markers and Papermania glittered flock. I was really pleased with the card but totally frustrated with how the photos came out. My poor neice is still battling with leukaemia : It's been nearly 10 years now since she was first diagnosed and has been through every conceivable treatment and it is hard and depressing that nothing has fully rid her of it. Please pray that she will get a lasting remission. I knew as soon as I saw the round sketch on Sandrine Vachon's blog that I wanted to use a bauble card for it: Used: Dovecraft card blank and adhesive ribbons; Docrafts Forever Friend stamp coloured with Whispers markers; Cuttlebug Mosaic and Snowflake embossing folders. Unfortunately I have been out of action with the migraine from hell for 3 days : I think it was the realisation that even if I made 4 Christmas cards a week for the rest of the year I still wouldn't replace what I sold in December! However, I spent this morning making a card for my neice that I can't show yet but at least it means I know I have more to post rather than just hoping that I will have! 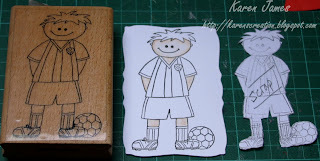 I want to get back to regular blogging and I have to get back to lots of making. Gosh, I thought there were lots going before Christmas but it hasn't stopped! Joani is giving away lots to celebrate 35000 hits ! Elizabeth Bell has a very special candy including her art work. Literally just got back from our trip to see family and friends in the UK so I hope you enjoyed the holidays and I wish you a very happy 2009 ! As we predicted, my step-daughter's baby (our first grandchild) refused to make an appearance before we left and is now 6 days overdue. Pink Gem Designs are offering a choice of 2 of their new January release stamps - I really love the designs so if you haven't discovered them yet I recommend a look: The stamps they released before Christmas are also good and their postage is very reasonable too. Another great stamp company are Starving Artists and they are offering all their new releases for candy: I love the DoodleFactory Valentine ReMix and it's definitely not just for Valentine's. And last but not least: Erin has a whimsical candy of a cute skunk with lots of sentiments.